The Chakras are part of our subtle anatomy. They are junction points between mind and matter. It is through our subtle bodies that our mind and spirit can communicate with our body. The Chakras are "step down" transformers. They bring the energy "down" from the insubstantial to the substantial, that is, they make the energy more dense so we can "communicate" with it and it can communicate with us. The Chakras are wheels of energy, taking in and giving out energy all the time. They CAN NOT be "opened" or "closed" but they can be cleansed or balanced. 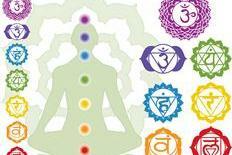 What is the course about: This one day workshop brings you on an introductory journey through the Chakras. It explains how the Chakras can hold the memory and knowledge of our life experiences It explains what our body is telling us through illness and fear. It gives you ways to balance and harmonies the energies of the Chakras. Introduces the use of a pendulum in energy healing.